BISCOE — A solar farm not only produces clean electricity and creates jobs, but also attracts satellite businesses and green industries that desire proximity to clean energy sources. That was the message from Joel Olsen, President, and Adam Foodman, Chief Operating Officer, of O2 emc as they welcomed over 100 visitors to the “early construction event” in Biscoe Monday. U.S. Sen. Richard Burr, R-N.C., said he looks out over the graded fields and sees jobs. “Before I got here, it was hard for me to visualize anything but a quail farm,” Burr said. The solar farm is growing on several acres purchased from the Town of Biscoe and the former Tobacco Stick Hunting Preserve between U.S. 220 Alternate in Biscoe and Interstate 73. Burr is a member of the Senate finance subcommittee which is debating extending the solar tax credit set to expire in 2016. O2 emc officials urged him to vote to extend the credit. Olsen said the federal government cannot build and operate renewable energy sources, but can offer tax credits. The projects also need private investment to provide the renewable energy infrastructure. N.C. Sen. Jerry Tillman, R-Moore/Randolph, said O2 emc has taken a property with a $500 tax base and turned it into a $100,000 tax base. N.C. Sen. Stan Bingham, R-Davidson/Montgomery, said he had never been so impressed with such an innovative project. Bingham said he had been interested in alternate energy sources since he lived in Australia and has two daughters who are engineers in that industry. Also on the early construction tour were N.C. Rep. James Boles, R-Moore, and N.C. Rep. Allen McNeill, R-Moore/Randolph, along with Montgomery County commissioners Jim Matheny and Jackie Morris and Biscoe Mayor Jimmy Blake and town commissioners John Beard and Gene Anderson. Olsen and Foodman took groups of about a dozen visitors in golf cart tours over the graded, rolling terrain where crews were installing the infrastructure for the solar panels on a 90-plus degree day, stopping to explain the steps in construction as the work progresses. The hard work to get the state and national permits, inspections by multiple agencies, meeting all the regulations and requirements and signing a power purchase agreement with Duke Energy began about two years ago, Olsen said. “Everything is in order for us to begin solar energy production which is clean, quiet, has no toxic emissions, has very little impact on the land and adds capacity to the local electrical grid,” he said. Construction materials are copper, aluminum and steel, which will hold their value if the farm is ever decommissioned. The solar panels are guaranteed for 25 years. Olsen said this solar project will produce 40 million kilowatt hours per year, enough electricity for 3,500 average homes per year. This farm will be connected to the Duke Power distribution grid, as opposed to the transmission grid. That means, Olsen said, the power will be used locally. “Having the power available to be consumed right here will be a beacon to attract more industries, be it in the MegaPark or anywhere in this area,” Olsen said. 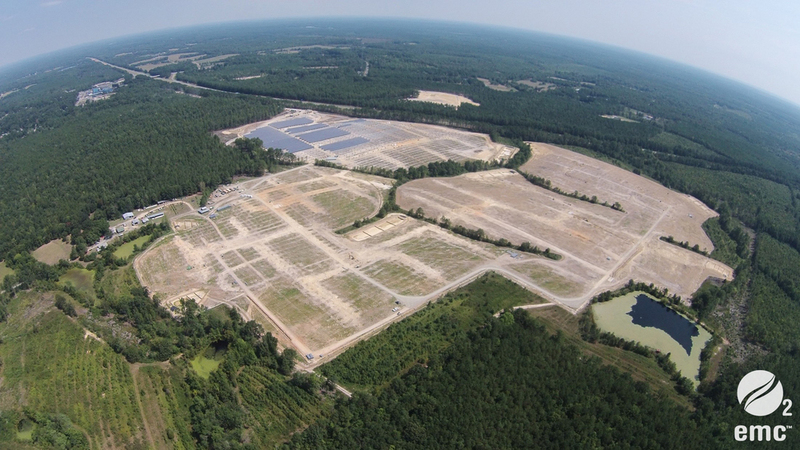 The Montgomery/Moore MegaPark is located just a few miles from the solar farm. The 20 megawatt solar farm will be on 123 fenced acres with about 50 acres “under glass,” which is what they call the solar panels. This is the first joint project since Olsen and Foodman joined to create O2 emc, which was formerly O2 energies. It has working solar farms in North Carolina, including a 5-megawatt between Star and Biscoe in Montgomery County which began producing electricity last August. Gary Freeman, director of renewable energy compliance and origination for Duke Power, said this will be one of the largest solar projects connected to Duke Power. The 15-year power purchase agreement with Duke Power has a fixed purchase rate of 6 cents per kilowatt hour. Olsen said he feels right at home in Montgomery County since the first project. Olsen lived in Japan and Europe for 16 years and saw the solar impact there. He started 02 energies when he returned to the U.S. and has now partnered with Adam Foodman, chief operating officer in charge of real estate and financing. Foodman said it was exciting to be on the site, to see the tangible results of the two years of negotiations. Foodman’s dad, Allan, had come from Charlotte to tour the site. His wife, Samantha, and two of their three sons, Parker, 8, and Asher, 5, were also on the tour. This will become a fully working farm with 1,000 sheep grazing under the panels. Sun-Raised Farms provides the sheep for all O2 emc projects and works with local farmers. Olsen said they have acreage on this site to have a birthing barn for ewes to deliver lambs and, in the future, hope to have a high-value processor. Biscoe Mayor Jimmy Blake said the town had cooperated every way it could to assist O2 emc. “We are very excited about this project and the potential it brings to Biscoe,” he said. The above graphic shows the amount of water, coal, electricity, fuel emissions, and gasoline that would have been produced annually if the same amount of power generated by Montgomery Solar was produced by fossil fuels.